The world’s first FlowRider® Triple is up and ready to open to the public in the next couple of weeks! The new attraction was born from a combination of many years of industry experience, engineering and riding hours, as well as rich relationships with top-notch suppliers. The ride surface has been widened by 10 feet compared to the popular FlowRider Double and the entire ride surface and side walls are inflatable- same patented technology used on the WaveOz™. Operators will love the versatility of this wave; run it wide open for 1 rider, easily add in up to 2 dividers creating multiple lanes for more patrons to safely ride simultaneously. One of South Florida’s most prestigious resorts, we are honored that the JW Marriott Miami Turnberry Resort & Spa, chose to feature the World’s first Triple FlowRider. The iconic resort has undergone an expansive expansion project where it transitioned from an Autograph Collection to JW Marriott’s newest destination. 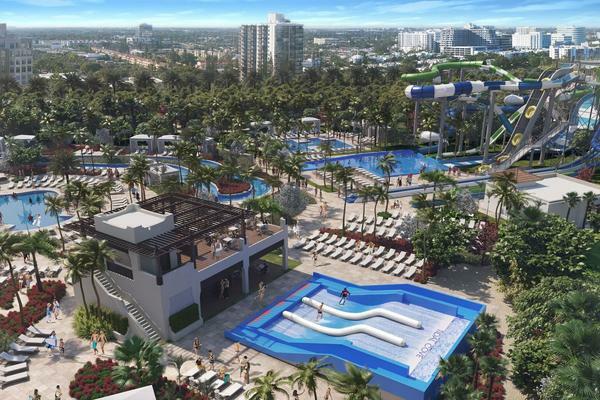 Making a splash in Aventura, Tidal Cove will be an experience unlike any other, with a 60-ft tower with seven slides, 25 luxury cabanas, two new poolside restaurants, lazy river, 4,000 sq ft Kids Cove playscape and of course the new FlowRider Triple!